In Japan the pheasant is believed to be a divine messenger of Amaterasu, the great Sun Goddess. Golden Pheasants have also been referred to as the cousin of the legendary Phoenix. 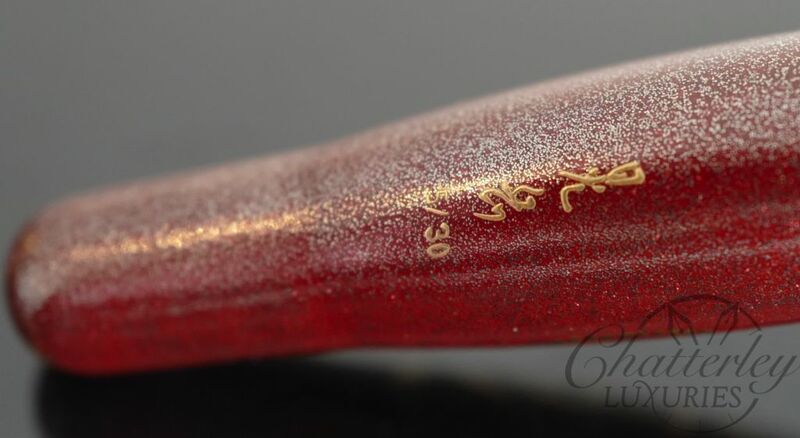 The base painting style of this pen is called Ishimeji, which means that the surface looks like rocks by paintings with different sizes of Urushi powders. It then has a beautiful raised maki-e golden pheasant portrayed on it with raden embedded for the eye. There is a delicate pattern surrounding the bird that flows around the cap and the body. 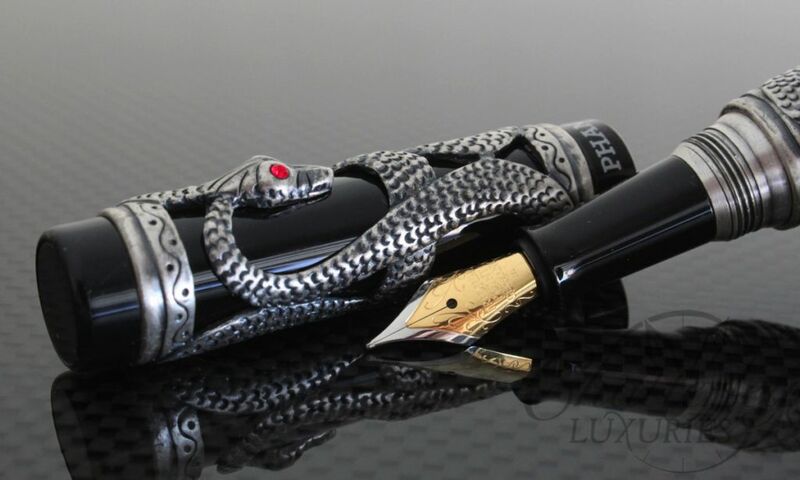 Danitrio makes remarkable hand painted pens using the Japanese skill and craftsmanship that has been mastered over the last few thousand of years. Good basic paintings start with base painting, which the craftsmen paint twice or three times with Urushi mixed with finishing powders to make the base hard and durable. Then followed by the interim paintings which is done by one or two layers preparing for finishing paintings. The base for Urushi paintings must be smooth and strong in order to have a good Urushi painting, which will last thousands of years. When the base is ready for painting, the first painting uses Sabi, Urushi mixed with polishing powders, as its base painting and call it Shita-nuri, the base painting. Then, Naka-nuri, the interim painting with Urushi is preparing for better Uwa-nuri, the finishing part of painting. The color of the interim painting has to be selected according to the color of the finishing part of painting. 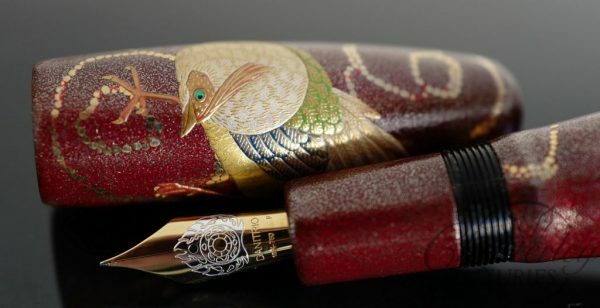 All these works are usually done by Nu-shi, craftsmen of Urushi paintings, painting 7 times in average and it takes 2-3 weeks before the Nu-shi can send back the pens to our Maki-e sh, who will do more Urushi painting works or Maki-e onto the pens. Craftsmen call Urushi is a living thing. Its qualities differ even from the same trees, for example quality is different from the trunk or branches. Different qualities from different trees or different areas or countries. Then, crude Urushi must be refined to make more than 10 different qualities of Urushi for different usage. Genuine Urushi is like pure gold only for fine jewelry and pure gold is too expensive for cheap works with cheap materials. 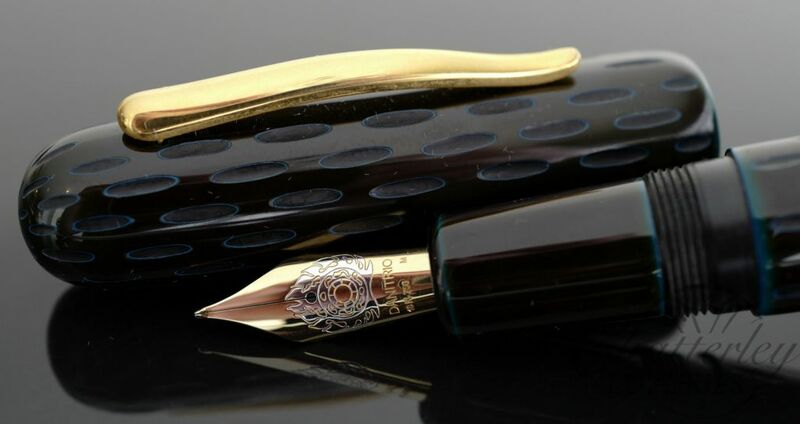 The pen fills via cartridge convertor and features a size 18kt gold nib.